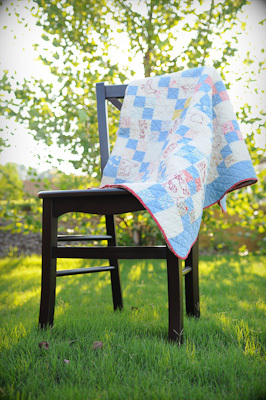 Special thanks to Mary Beth today, who is providing the last in this mini-series of vintage and antique quilts! We’re back tomorrow from our vacation, back to unpacking boxes and organizing the rental house where we’re living temporarily, back to hunting for our “forever house” and getting used to this new stage in our family’s life. 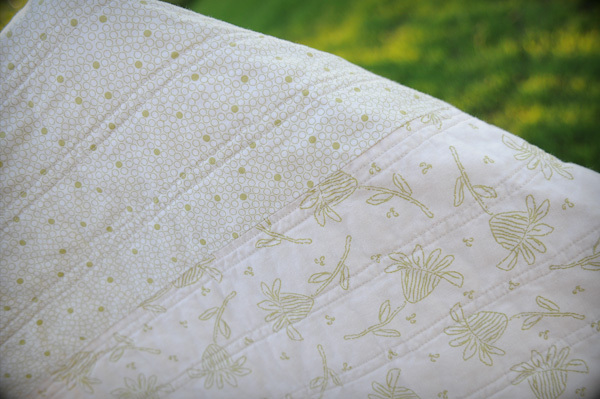 It’s overwhelming and exciting, and I’m grateful for the ladies who have shared their quilts and stories with us the past week for giving me a little room to breathe! Hope you loved everyone’s quilts as much as I did. A trip to visit my grandparents is never complete until Grandmother has disappeared for a few moments and returned with a package carrying a piece of family history and a story to go with it. 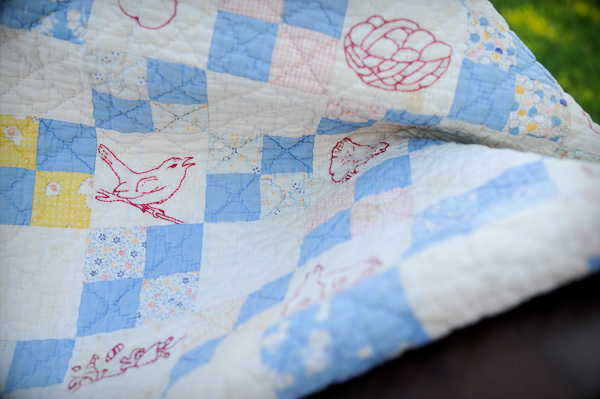 About a year ago, when I was pregnant with our first daughter, she slipped out of the room and emerged a few minutes later with this: A quilt that her mother had made for her the year she was born. Every other white block is embroidered with a picture, but my favorite of the embroidered blocks is highlighted below. Her name and the year she was born (1934). 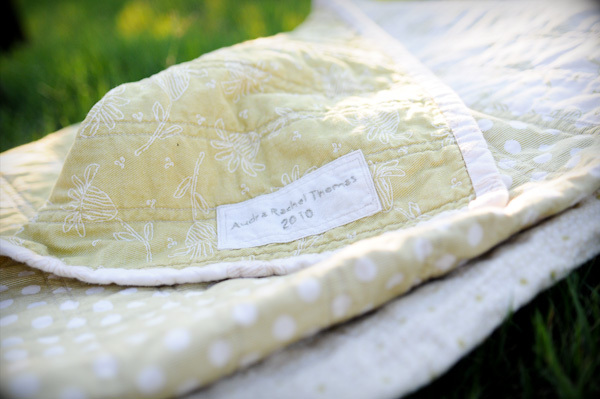 When I saw it, I knew that I had to make a baby quilt for my own sweet girl. As a true beginner at sewing and with no concept of where to even begin on a quilt, I set an achievable goal, picked out fabric (courtesy of Whipstitch Atlanta! ), got to work, and finished it Christmas morning. It is a joy to see our daughter with her own quilt now and imagine it being passed on in the years to come. Thank you so much for providing a place of inspiration and opportunity for the new sewers who are just getting their wings. 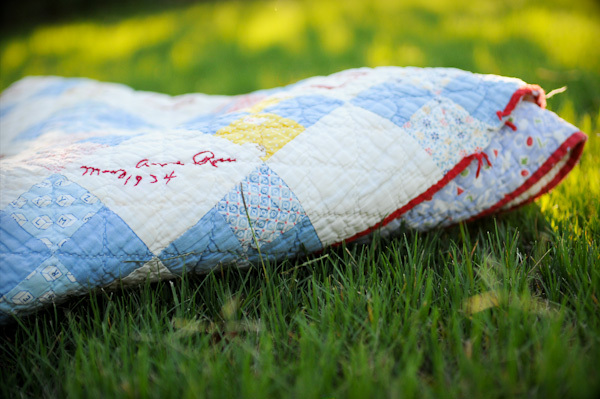 Thank you for including our story in your antique quilt series! I have loved reading each and every one of the posts. Hope your vacation was just what you needed in the midst of the craziness!